There is nothing unusual about the design of the neat and handy Lash Boos eyelash enhancer. It is another serum captured in a silver bottle yet this time the bottle is secured with a white and brown tube for storing the product and protecting it from damage. This element tells you it’s Lash Boost Serum. Is there anything more interesting about the cosmetic? Regular use of Lash Boost eyelash enhancer for several weeks makes your lashes look fuller, longer and darker. It is confirmed by clients who like the effects of stronger lashes delivered by the serum. Lash Boost works in a delicate way so it is a perfect product if your lashes aren’t extremely damaged and weak. 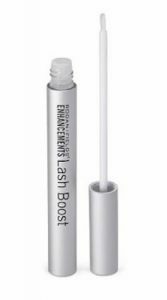 Lash Boost eyelash enhancer conditions your eyelashes and reinforces their structure. The application method is precisely described on the website of the product. Make-up removal and cleaning the face is the first step. Next, you apply Lash Boost eyelash enhancer only to the upper lash line. It is very important not to wash the face and eyes right after the application because Lash Boost Serum is absorbed after about 2 minutes. An every-day and precise application is a must to enjoy maximum effects of using the serum. It isn’t one of the most popular options but it offers interesting components rich in natural substances e.g. plant extracts and vitamins. On the other hand, the price of Lash Boost is quite high, considering the delicate action. Lash Boost Serum isn’t recommended for eyebrow care. – quite easy to use.